Nach zwei Tagen voller spannender Vorträge und zufriedener Besucher ist gestern das MSLD-Lichtforum 2017 in Dresden erfolgreich zu Ende gegangen. Das MSLD-Lichtforum findet traditionell als ein Schwerpunkt der Dresdner Bau- und Immobilienmisse Bauen Kaufen Wohnen statt. Ruairí O’Brien. Lichtdesign. konnte als offizieller Partner des MSLD-Lichtforum 2017 mit seinen Erfahrungen aus der Planungspraxis spannende Inhalte zum Vortragsprogramm beitragen. In dem von Ruairí O’Brien konzipierten Moodroom, einer Lichtkammer zum Erfahren von Lichtfarben und Stimmungen, konnten die Besucher selbst ausprobieren, wie Lichtfarben sich mischen lassen und wirken. Wir erlebten eine erfolgreiche Veranstaltung im Dienste der Lichtkultur, die Lust gemacht hat, auf eine Fortsetzung im nächsten Jahr. 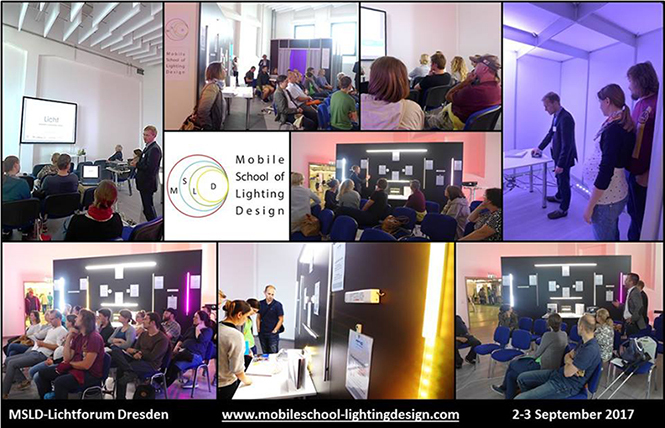 MSLD – Mobile School of Lighting Design – offers professional courses and workshops in light and lighting design. The school has a unique mobile concept. It is free to move from place to place like “the bee visiting the flowers”. This is an inclusive and sustainable teaching concept where the school visits its students, clients and the public in general. The mission is to spread the word about the importance of good lighting design, to inspire and to influence future city planing and to encourage cross-fertilization among the design disciplines. The mobile school of lighting design has set itself the task to create a greater awareness and understanding of the phenomena of light and its importance to humankind in a singular way. 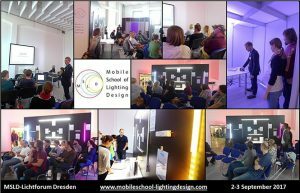 The teachers of the MSLD – Mobile School of Lighting Design are international highly respected professional lighting designers who want to share their expertise and knowledge with society. The MSLD follows a five I’s approach: Inspire, Include, Instruct and Initiate, I-You-We.